They say every quilt has a story and this quilt definitely has a story. This story resulted in this quilt's name. Wait, do they say that and who's "they"? Regardless, let me share a tale with you and since this took 4, almost 5 years, to complete, go grab a cuppa something, sit down and get comfortable. 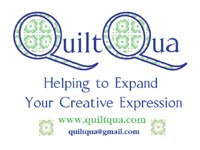 It all started with my sister who wanted to hire me to make a quilt for my SIL. I told them it was good practice (I'd only been quilting a couple years) so covering cost of fabric would be all that I'd ask for. V (SIL) chose the Jinny Beyer Shimmering Sea pattern and asked for it to fit a king quilt. I thought, no problem, I love foundation piecing! I did not pay attention to my inexperience or the level of skill they cautioned as needed. I took V to the store, she chose most of the fabrics and then I go started cutting. I cut, a lot. To put it in perspective, there are 45 pieces in each block and I decided to make a 6x6 quilt. That's 36 blocks which means 1,620 pieces, borders not included in this quilt. Add borders, binding and backing and I have 1,640 pieces of fabric in this quilt (I'm counting the back and binding as one each). That's the most I've ever done for one quilt! Anyway, I cut and then I copied and traced 36 foundation patterns but not before dealing with the first mishap. A pup who, it seems, did not appreciate Ms. Beyer's pattern in the same way I did. I bought more tape that night. Eventually I started sewing and on the third block, realized I had a problem. I sewed it backwards (the design was rotating in the wrong direction). Once I realized how this happened, I figured I could avoid it but no, I managed to do it 3 more times. 4 blocks I now have as scrap blocks. I kept sewing. Each block took me between 1 hr and 15 minutes to 1 hr and 30 min. to complete. I wondered what was wrong with me. Then I would put it away for a while, months at a time. We moved houses, I lost the fabric pieces and blocks for a bit but I knew they would turn up sooner or later. Eventually they did but then my sisters’ dog was ill and had a hard time controlling her bladder. I couldn’t justify rushing to finish a quilt that would have to sit in a closet. I took my time with it but was feeling ambivalent. So I put up blocks on a design wall and shared it with my sister. It did what I wanted it to do, set my sisters on my tail to find out when it was going to be complete. I had a plan. I was going to finish it and take it down to them when I visited at the end of February. I was making good time. I loaded the quilt on the frame and started quilting it. Then, I started having machine problems. The knob to raise the presser foot broke, the tension screw was stripped and the lever to raise/lower the presser foot was out of alignment. That may not sound bad but I didn’t know those were the issues when they presented themselves. Thankfully, Nolting (Hinterberg) was VERY RESPONSIVE and super helpful with their responses. I couldn’t, however, finish the quilt in the time frame I wanted and I did have to talk with the tech/sales people at the same quilt show I was heading down my sister’s way for. I threatened Ms. Midge (my machine) that it might be time for me to purchase a new one. I only had this much left to quilt when she decided to act up. I was able to finish it up and add the binding. Then I realized there was no way I could take pictures which would do it justice. This thing was big and beautiful. Now what? Ah yes! I’m giving it to a photographer after all. I sent it to her and then on Easter weekend, we went to the docks and took some photos. Of course the day had to be windy and we were hanging on to it for our lives. We had visions of it slipping away and landing in the water. Talk about the most nerve wracking photo shoot ever! But it was worth it. Look at what she came up with. It makes this quilt look great and I’m a bit amazed I made it. Despite the long term process and despite the hiccups I have come to love this quilt after seeing these pictures but I’m am glad I don’t own it. That reminds me, of its name. Poltergeist is the descriptor because, frankly, all the little things that happened during its making and all the time it took to complete it. Rabbit because it’s a substitute for the swear word I uttered often completing this quilt. The “f” word substitute came from my SIL when the kids were young and listening to what we said. So here you have it, the Poltergeist Rabbit shown in pictures that are fantastic from Ren Photography in Hampton Roads, VA area. the quilt is beautiful ! My goodness, my gosh! I've overcome many an obstacle, but not sure I could have mastered four years of them. Your poltergeist is simply stunning. How about sending your mistakes my way. Absolutely Gorgeous! Worth all the time and trouble--it's a treasure! beautiful quilt! I bet you are glad to be done with that one though! Oh, I would love to have this quilt, maybe not make it though. If I had made it I would be loathe to part with it.